The ATMO System 30 uses a Panasonic Variable Compressor. The variable compressor is designed to work only when needed thereby saving electricity – the fixed compressor will cycle on and off on a predetermined fixed cycle. This control strategy leads to a reduction in the average speed of the compressor and fewer stops and starts. 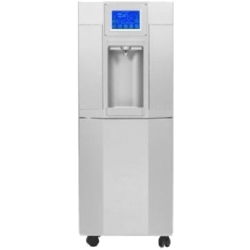 • Hot and Cold Water • Up to 8 Gallons or 30 Liters per Day • 12 Stage Filtration Process • Reverse Osmosis • UV Lights • Alkaline Option • Solar Power Option • New negatively charged hydrogen which increases cellular hydration in the body. • ORP levels 600MV - 700MV • 2.4 parts per million per Liter of hydrogen. Atmo Systems HI all rights reserved.